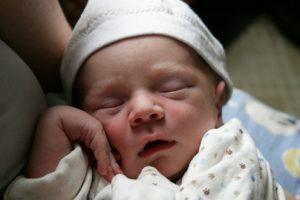 Families are increasingly choosing to have their babies in the safety and privacy of their own home, or in a home-like setting such as a birth center. 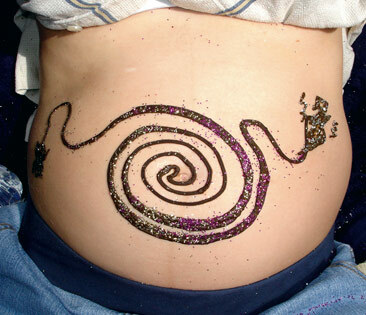 At Northern Sun, we offer a unique blend of mainstream medical therapies with naturopathic midwifery care. Our families can continue to receive care after the birth, much like an old-time general family practice. As a midwife, Sarah helps guide parents in southern and midcoast Maine through pregnancy and birth, informing them about the myriad of options for care. They believe in women’s bodies and their ability to create and nurture life. With good prenatal care, education and emotional support, birth centers and home birth provide a safe alternative to birthing in a hospital. As a naturopathic doctor, Sarah offers support for parents including discussion of childhood development, breastfeeding, weaning, nutrition, naturopathic home remedies, vaccinations, sleep habits and more in this journey to raise happy, healthy children. Certified Professional Midwives are well trained specialists of normal birth outside the hospital setting. The CPM credential is a competency-based credential and all CPMs must meet minimum standards of knowledge and clinical skills as defined by the Midwives Alliance of North America (MANA) and the North American Registry of Midwives (NARM). Certified Professional Midwives must pass standardized tests, be certified in neonatal resuscitation and CPR, and obtain continuing medical education for re-certification. We offer the following midwifery and birth services for southern and midcoast Maine. Visit our testimonials page to read about real birth experiences with Northern Sun midwives. At Northern Sun, we are pleased to offer families in midcoast and southern Maine the option of having their babies at a birth center. The Birth Center at Northern Sun is a clean, comfortable space adjoining the Northern Sun offices. 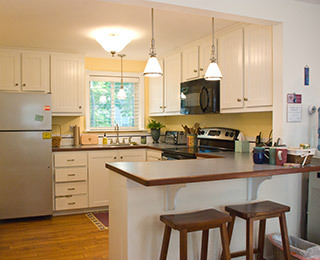 It includes a family room, private bedroom, kitchen and built in birth tub in the birth suite, with surrounding gardens providing the freedom to walk, rest and relax during labor. Learn more about the Birth Center at Northern Sun. Many women choose to labor and birth in water, which provides a calming, relaxing atmosphere and eases the intensity of labor naturally. At Northern Sun, we specialize in waterbirths and have been offering women the option of birthing in water since 1995. The birth tub at the Birth Center at Northern Sun is designed for birth, and is large enough for both mom and her partner to relax or birth their baby. At home, we provide resources to purchase a tub for home use and rent tub set-ups that provide all the tools to fill and empty the tub. Laboratory testing is an essential tool that allows the practitioner to evaluate a patient’s state of health. These diagnostic approaches allow us to look deeply into how the body manifests illness. We use local laboratory services as well as specialty laboratories around the country that may focus on more unique conditions such as food allergies, and evaluation of hormonal or neurotransmitter production during pregnancy and postpartum. We use local hospitals and ultrasound facilities to perform ultrasounds when appropriate. With our on-house lab, most tests are collected in the office, while others can be completed in the home and mailed directly to the laboratory where it will be processed and the results sent to our office for interpretation. Analysis and discussion of lab results is an integral part of the care our doctors provide, to ensure complete understanding to aid in the innate healing ability of the body. Due to our concern with issues regarding quality ingredients used in the manufacturing of supplements, we provide a full line of botanical and nutritional products that are carefully chosen and researched by our doctors. At Northern Sun we are committed to using the highest quality, organically grown or wildcrafted herbs available. We are conscious of supporting responsible harvesting and processing techniques so that the best products will always be available for our patients use. We also offer online ordering through some of the companies we use if that is more convenient for our patients. Northern Sun is pleased to offer screening for hearing loss, without sending your family to a hospital. Testing is done in the office while your baby is in your arms, sleeping, or in a car seat. Testing is non-invasive and usually takes 10 to 30 minutes. It is important to know if your baby has hearing loss as soon as possible to allow your baby to get the special help needed for language and social development. We cannot always tell by watching a baby how well he or she can hear. Studies show that many children with hearing loss are not identified until they are over two years old, but the first two years of a child’s life are critical for speech and language development. Why Choose to Birth at a Birth Center? Birth centers provide family-centered care for healthy women and are based on the midwifery model of care for pregnancy and birth. Birth centers are fully equipped medical facilities that provide a cost effective choice for healthy women to have their babies. 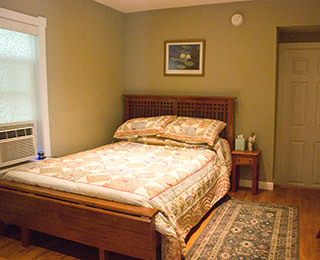 The Birth Center at Northern Sun was designed with your comfort and safety in mind. Care is provided by midwives who know you and provide excellent care with appropriate medical intervention. The birth suite has a large birth tub available to you during labor and research shows there are many benefits to laboring in water, including lowering blood pressure and preventing perineal tears. 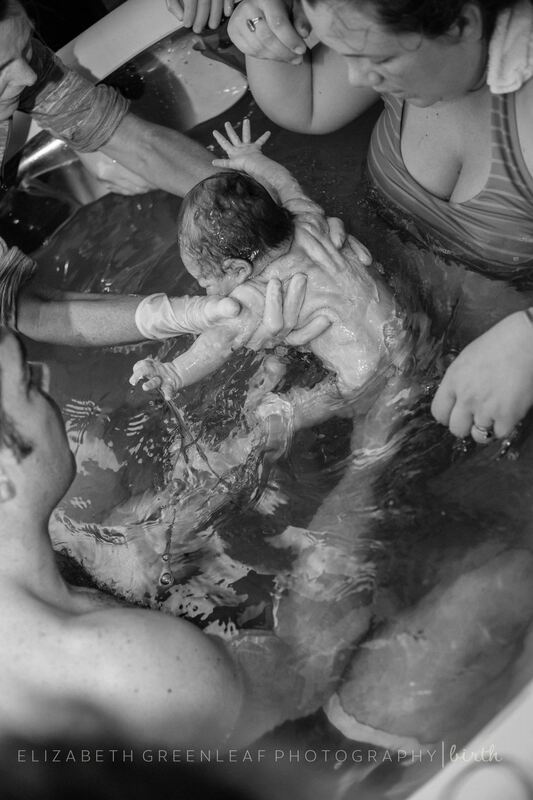 We also support women to give birth in the tub and are skilled in water birth. 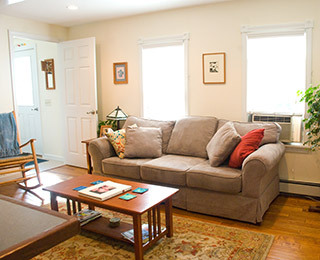 Home birth provides a safe, familiar and private surrounding for labor and birth. It allows for individualized care with a midwife whom the family knows and trusts. Women who choose to birth at home are supported to discover their own strengths and trust their intuition in becoming a mother. Being at home allows for the family, particularly other children, to be involved in the birth of a new baby. At home, immediate bonding occurs easily as the baby remains with the parents at all times. Breastfeeding rates are among the highest in the nation when a mother births at home with midwives. 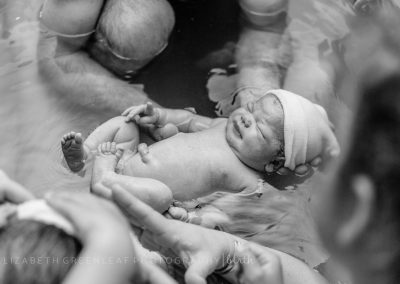 Home birth affirms that birth is a natural and profound life event. Birthing at home reduces unnecessary interventions and significantly reduces the risk of infection. As midwives, we strive to nurture a woman’s sense of personal strength and self-confidence, so she may realize birth as an empowering experience. At a time when birth has become a medical experience and women are becoming more and more fearful, birthing at home encourages women to claim their power in pregnancy and birth. Sometimes birth leads us to the very edge of ourselves and then asks us to take a leap of faith. What we learn about ourselves in that leap will always be a part of who we are and guides us into motherhood. A woman births a baby from deep within herself, calling upon those around her, her heart and spirit to complete the journey. Many women choose to labor and birth in water, which provides a calming, relaxing atmosphere and eases the intensity of labor naturally. At Northern Sun, we specialize in waterbirths and have been offering women the option of birthing in water since 1995. 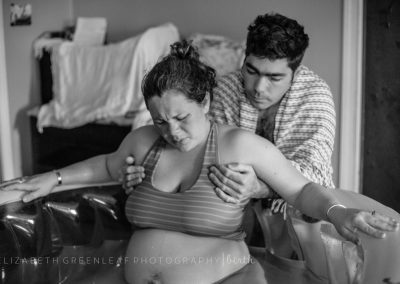 Birthing in water encourages a woman’s partner to be supportive and involved. 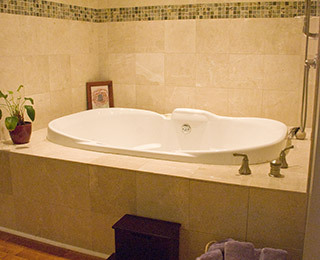 The Birth Center at Northern Sun has a built in Jacuzzi birth tub in the birth suite, with plenty of room for both laboring and giving birth. At home, we offer information to purchase a birth tub and provide tub set-ups to rent that have all the tools needed to have a waterbirth. For more information about waterbirth visit Waterbirth International at www.waterbirth.org. What is a Home Birth Like? 6:00 PM: High winds. Ice storm. Slight cramping. 8:00 PM: Heavier cramping. Started keeping track of contractions on palm pilot. No electricity! 12:30 AM: Water released. Called midwives. 5:30 AM: Began “slow dancing” with Jeremy during contractions to jiggle the babe down and get things moving. Still no power…so no birthing pool as planned yet. 8:00 AM: Continued to rest on our bed between contractions and “slow dance” during surges. I rested with the sound of the four women chatting in the other room, and even giggling at times. It seemed such a joyful atmosphere. 9:30 AM: Power came on, yeah! But the electric pump hadn’t been plugged in so the birthing team earned their keep by hand pumping the pool with a whistling foot pump. Even I was entertained. 10:15 AM In the pool, ahhh! So nice to get off my feet and rest my legs. Jeremy silently sitting behind me and holding me; only later did I learn that he was quite uncomfortable when I put all my weight on him during contractions. I knew it wouldn’t be too long, so I propped up on my knees and elbows on the edge of the pool and settled in for the last few pushes. In this position it was only a few more contractions and deep ohms, with the whole team ohm-ing with me, when her head pushed out. With Sarah and Jeremy poised behind me, I felt her slide out in the last push. stretched, arching her back and sticking out her bottom. I remembered that stretch very well from in the womb when her bottom would push against my belly. 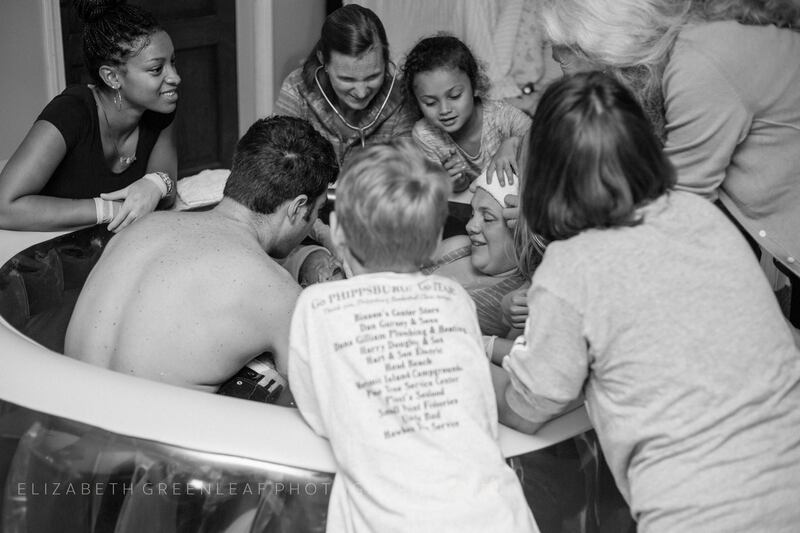 It was such a relief to see her healthy and well and so beautiful! She was interested in nursing. It took a few minutes to get her latched on but then she was suckling away. The umbilical cord was short so she just stayed right at my breast while we relaxed for a few minutes. The remainder of the day blurs together. I recall little else other than the birth team puttering around for a while cleaning up and keeping an eye on us. When they felt all was stable, they left and it was just the three of us in our bed. Our new family. I was so exhausted but I slept very little that day or night, just watching my wonderful husband and our beautiful girl breathe and stir and sleep. Imagine lying in bed in the middle of the night, awakened by the sensations swirling around your baby, aware that the surges are starting. You lay there as long as possible, hoping to get as much rest as you can before things get going, then slip out of bed and draw a bath, and sink into the warmth and comfort of the predawn darkness and water embracing you. As the sun is coming up, you wake your partner and he brings you toast and tea before you head out for a walk by the ocean, connecting with the power of the waves and feeling the same energy moving your baby down. The contractions are stronger when you get back home, so you call your midwife and let her know things are happening and she comes over to check on you and the baby. It is early, so she encourages you to go about your day, keep eating and resting and wait for the baby. You continue the labor dance with the support and love from your partner or mother or friends in a familiar and peaceful surrounding. There is no hurry, there is no rushing off to bright lights and strangers, to be measured or attached to an IV, just in case. There is just you birthing your baby as you go deeper and deeper within yourself. Soon your midwives arrive and get set up, looking as if they are moving in with all their equipment, turning your home into a place of birth. As the surges increase, you feel the sensations pulling you downward and are ready to become submerged in the depths of the pool of warm water in your living room. 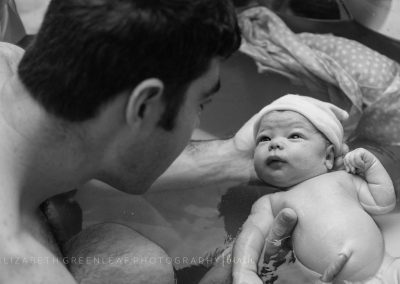 Your partner climbs in too, completing the sacred circle to welcome your baby. Certified Professional Midwives are well trained specialists of normal birth outside the hospital setting. The CPM credential is a competency-based credential and all CPMs must meet minimum standards of knowledge and clinical skills as defined by the Midwives Alliance of North America (MANA) and the North American Registry of Midwives (NARM). Certified Professional Midwives must pass standardized tests, be certified in neonatal resuscitation and CPR, and obtain continuing medical education. We always start with an initial consult, so you can meet the midwives and have plenty of time to ask questions. This visit is intended for you to be able to decide if you would like to continue care with the midwives at Northern Sun. The initial prenatal appointment includes a thorough medical history, a physical examination, and lab work. What is included in midwifery care? Prenatal visits, 2 post partum home visits, 3 postpartum office visits, on-call care related to your pregnancy, and a massage at Northern Sun are all included in the delivery fee. Not included in this fee are charges for lab work, supplements or dispensary items, emergency labor supplies, or childbirth classes. Can I have a water birth at home? Yes. Many women choose to labor and birth in water, which provides a calming, relaxing atmosphere and eases the intensity of labor naturally. At Northern Sun, we have been offering water births since 1995. 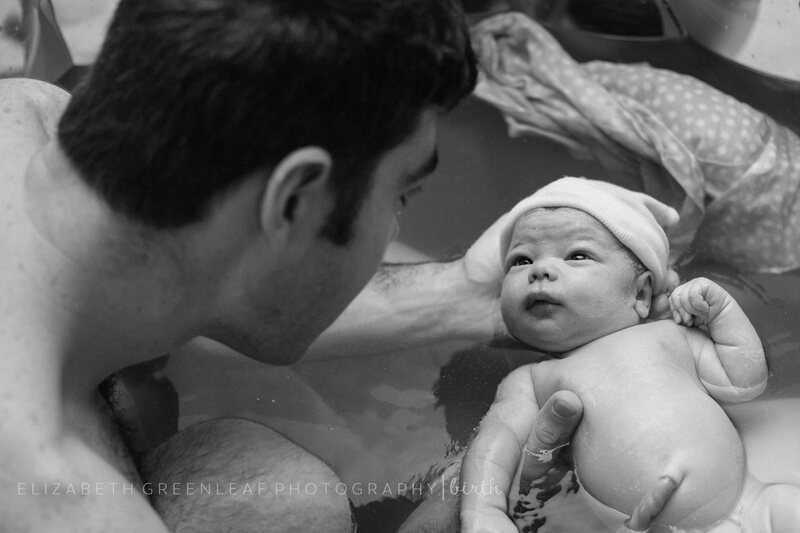 It is a safe and gentle way for the baby to transition from one warm watery environment to another. Plus, birthing in water encourages a woman’s partner to be supportive and involved. See our gallery for images of water births. 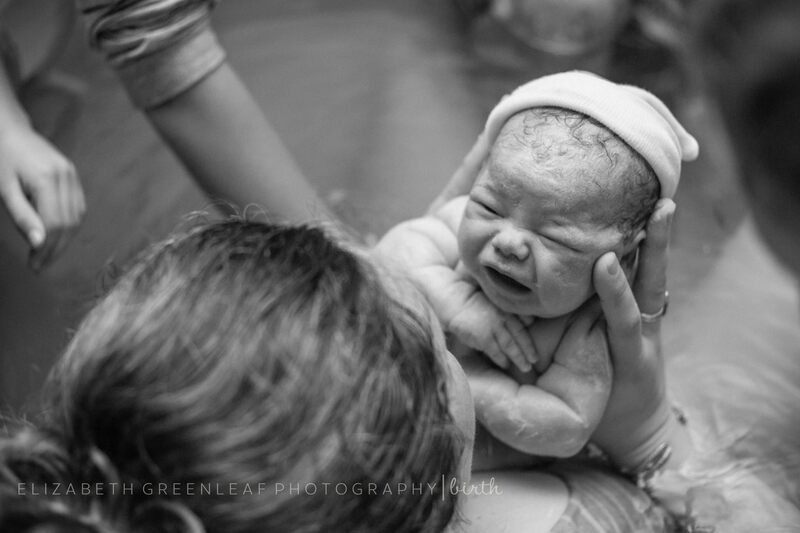 Can I have a birth at home or the birth center if my last baby was born by cesarean section? A VBAC or vaginal birth after cesarean has become a bit controversial in the childbirth community. Any previous trauma to the uterus, including the incision made to birth a baby during a cesarean section slightly increases the chances that the uterus may rupture during a subsequent labor. At this time we do not accept VBAC clients however have offered many women co-care with an OB-GYN. If you are planning a VBAC, please contact us to discuss how we can offer supportive co-care during your prenatal period, labor and birth. Do I have to go somewhere else to get lab work done? No. Most lab tests are collected in the office. For your convenience, lab testing can also be done at other facilities. Analysis and discussion of lab results is an integral part of the care we provide. We are happy to answer any questions you have regarding your lab tests. Ultrasounds can be ordered through local imaging centers as needed or if desired. Are childbirth classes offered at Northern Sun? Yes. Childbirth classes are offered here at the birth center through our Childbirth Educator Laura Duffy. For more information and to find out about upcoming classes, please contact her by calling 207-313-9156 or by emailing laura@mainelybirthing.com. Can my child continue to be seen at Northern Sun? Yes. As naturopathic doctors and midwives, we are qualified to provide pediatric care after regular midwifery care has been completed at 6 weeks. We recommend pediatric care at regular intervals that includes nutritional assessment and ensures your baby is meeting his or her developmental milestones. Are naturopathic doctors and certified professional midwives covered by insurance? A number of insurance companies cover naturopathic services and laboratory fees as well as home births. Please contact your insurance provider to determine if they cover naturopathic medicine and midwifery services. We would be happy to provide you with an invoice from our office to submit to your insurance provider for reimbursement. Because we are a small office we do not bill insurance companies, and request payment at the time of service. Can I get supplements from your office? Yes, we carry most of the supplements we prescribe. We thoroughly research and selectively choose the products, including organic and wildcrafted herbs whenever possible. The products are physician grade and of the highest quality available. Midwifery and naturopathic medicine are new to me – can I call with questions? Yes, we encourage you to call (207) 798-3993 with any questions and our staff or doctors/midwives will be happy to help you. 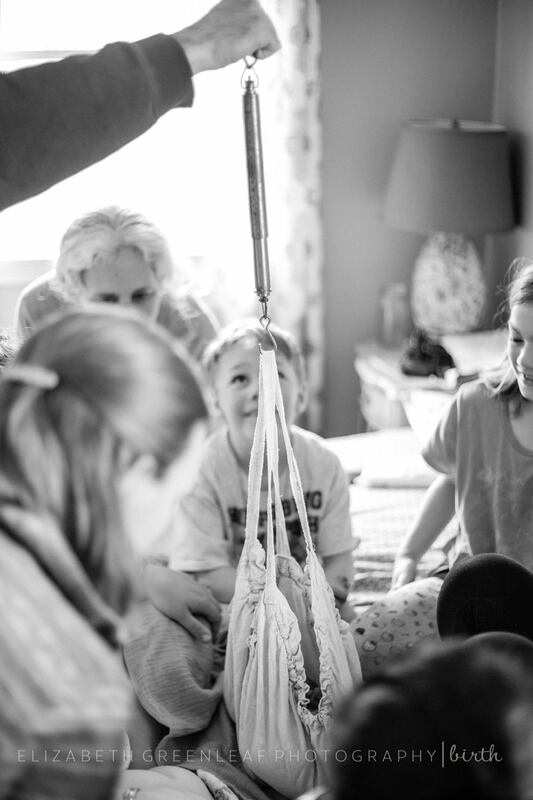 Sarah and Carrie are committed to empowering women to trust themselves and trust in birth. Despite our technological age, many people recognize that birth is a sacred time for a family. River Daniel Louten came into this world through water birth in our sunroom. My husband, Danny, and I labored throughout the day, walking the dirt roads in Harpswell to keep the process moving along. It was a warm fall afternoon and the outside air was refreshing during each contraction. The midwives arrived at our side when needed and were a gentle presence. They encouraged me to be strong, yet relax when needed. As the sun set I walked about our home with my husband and these loving women at my side. 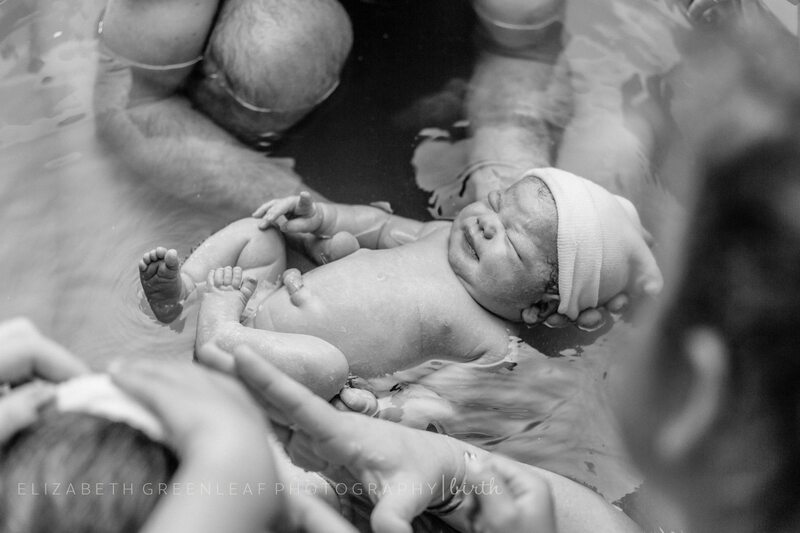 In between rain storms, River peacefully came into the world surrounded by warm water. My husband was able to get in the water with us and share this moment of pure joy. Sarah continued to care for us as if we were family. They not only conducted full exams on myself and our new baby boy, they also made us breakfast in bed at 3:00 am! I began seeing Sarah for midwifery services for the home birth of my daughter and soon thereafter left my functional healthcare facility for Northern Sun. Sarah is our primary doctor, but we have had thepleasure of working with many wonderful people through Northern Sun. I came to Northern Sun and to see Sarah Ackerly with my second pregnancy, searching for a better birth than that of my first child. 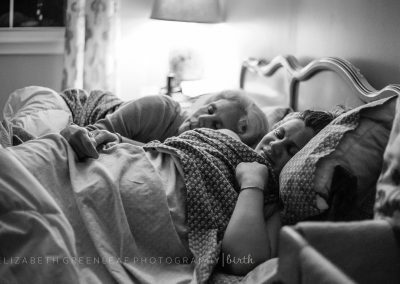 I knew I could not bear to have another hospital birth, and I knew Sarah would do everything she could to ensure my birth was at home, just as I wanted. While I may have come in looking for a better birth, in actuality, I got the best birth possible. The combination of having Sarah as my midwife and using the tools of hypnobirthing proved to be invaluable to me. I enjoyed my labor, and I enjoyed my birth; two statements I had never thought possible. Hypnobirthing and home birthing allowed me to really experience the beautiful process of labor & delivery. I had heard some women talk about painless births, and I had immediately dismissed those women’s experiences as hippy delusions. When it came time for my own home birth, I surrendered to this idea. Surrendering was the smartest decision I have ever made. My labor was certainly intense, but it was not painful, because it was not fearful. That is the beauty of home birth and midwifery. I knew that my body, my baby, and I were going to do this whole birth well, and I surrendered to that force. “It would be all too easy to sum up my birth experience in one word…Wonderful. From my first visit, to the birth of my beautiful daughter, Dr. Sarah was always there for me and my family. 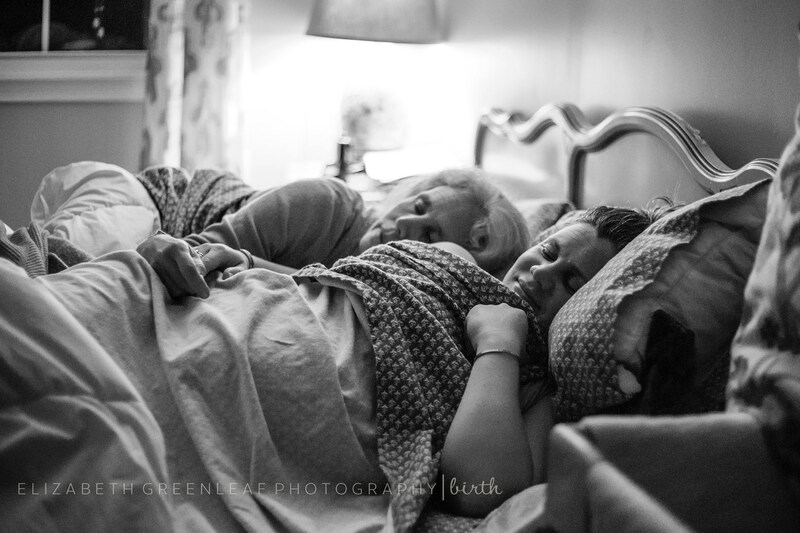 Having had a hospital birth prior to my home birth, I was able to fully appreciate how great a home birth can be. Dr. Sarah spent twice as much time with you during appointments, and really gets to know you and your whole family. 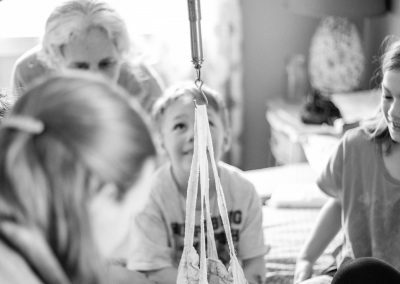 They don’t just hear what you want in a birth experience…They listen. I didn’t once have to remind them of the choices I’d made; As opposed to the hospital where, sad as it is, you have to fight to have a natural birth. I have had the privilege of birthing both of my children with Sarah. My husband and I choose her as our midwife because we both were drawn to Sarah’s warm personality and professional, yet down to earth, manner. Our prenatal visits were a joy. Sarah always took time to answer our many questions and share helpful information not only for birthing, but transitioning to our new role as parents. Our daughter, who recently turned eight, was born almost seven weeks early so it was necessary to birth her at Maine Medical Center. Sarah accompanied us to the hospital and remained a part of our support team. Sarah’s calm spirit, vast knowledge, and positive support contributed to us experiencing a beautiful natural birth even though we were in the hospital. Four and a half years later we were thankful for the chance to finally get our home birth. Once again, Sarah was such a critical factor in our birth journey as our son come peacefully into the world with a lovely water birth. TV shows, movies, and conversations with others paint a picture of a horrid scene of labor and child birth where a lot of intervention is needed. But the truth is, even though labor is a very intense experience, it is one of the most empowering experiences a woman will ever go through. I did not want anything to take that away from me or my little girl. So having a home birth was the only option for us.